Life is about conversations . . .
Is the young generation concerned about litter-free environments? Is it willing to do something about raising awareness? Is it looking at innovative ways to get the message across? You will find answers to these questions in this interview with Sandeep Tibrewal of Bengaluru. 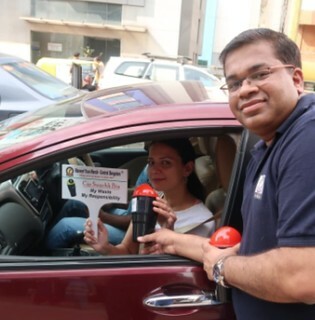 In this #citizenconnect interview, we talk to Sandeep Tibrewal about his new awareness drive for Bengaluru – the first segment of which has just been launched with his enthusiastic team of supporters. Sandeep Tibrewal is an experienced real estate professional, based in Bangalore. He specializes in Purchase and Contract related legalities and negotiations. Outside the portals of business and work, Sandeep is the President of an active wing of the Marwari Yuva Manch from Central Bangalore (MYMCB). This interview is about that attractive car bin that’s being handed out free by his team, at popular traffic intersections in the city.